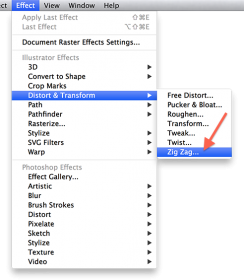 This trick is a little bit more difficult than the Adobe Photoshop trick, but still very do-able. 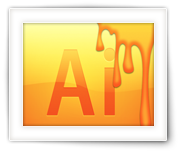 A little bit of experience with Adobe Illustrator however will make things a little easier. 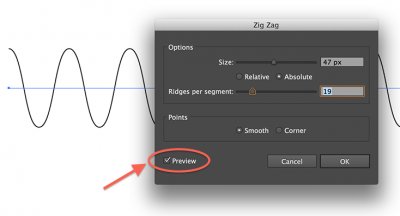 For this trick to make a nice sound wave, we will use the Illustrator ZigZag and Blend option. Create a new document – I used the standard “web” size (960 pixels x 560 pixels) in landscape mode. Draw a straight and horizontal line. When the effect window opens, start by checking “Preview” – it will be very helpful when tweaking the settings. Check the option “Smooth” under “Points“, since we want smooth curves and not pointy zig zags. Now use the sliders “Size” to increase amplitude (height) of the waves, and “Ridges per segment” to change the number of waves. In the image above you can already see how nice the sine or sound wave is starting to look. Click “OK” when you’re done playing. From the main menu now select “Object” “Expand Appearance” which reveals the vector we want to modify. 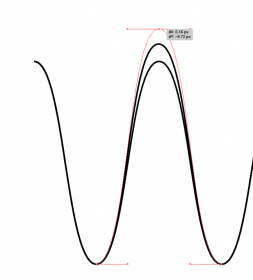 Next we copy our wave since we need 2 waves – simply use “Edit” “Copy” (or: CTRL/Command + C). Create a new layer (CTRL/Command + L). Use “Edit” “Paste” (CTRL/Command + V) to get the copy wave on that new layer. Use the “Selection Tool” (press “v” on your keyboard) to select and drag the copy of the wave directly on top of the other wave. Use the “Direct Selection Tool” (press the “a” on your keyboard), click a high or low point with the left mouse button, now press and hold the SHIFT key and use the pointer to drag the point up or down. These points should represent the extremes you have in mind. Release the SHIFT and mouse button and repeat the previous step (13) for all waves that you’d like to modify so you get something like the picture below. In this (optional) second step we are going to fill in the gaps with additional waves that fit nicely between the two waves. For this we will use the “Blend” tool. Select both waves (CTRL/Command + A). 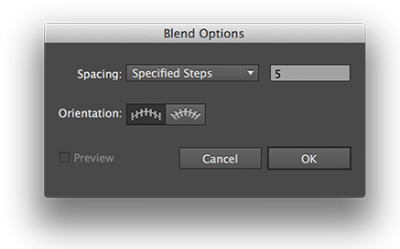 Select from the main menu “Object” “Blend” “Blend Options“. 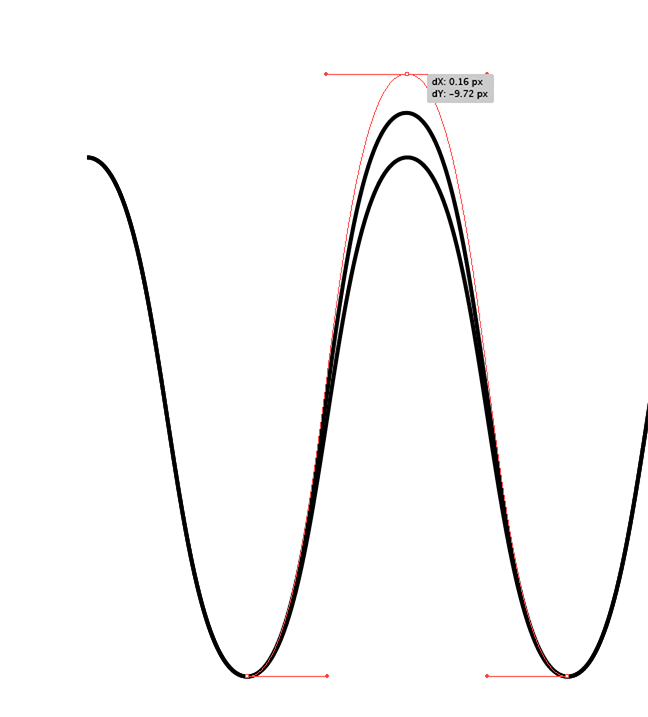 As you can see: a nice sound wave for illustration purposes is the result. Now that you have gone through this exercise, you’ll probably want to do it again to fine tune your sound wave even more. If you’d like to use this drawing in Photoshop: simply select all (CTRL/Command + A), copy (CTRL/Command + C) and go to photoshop. 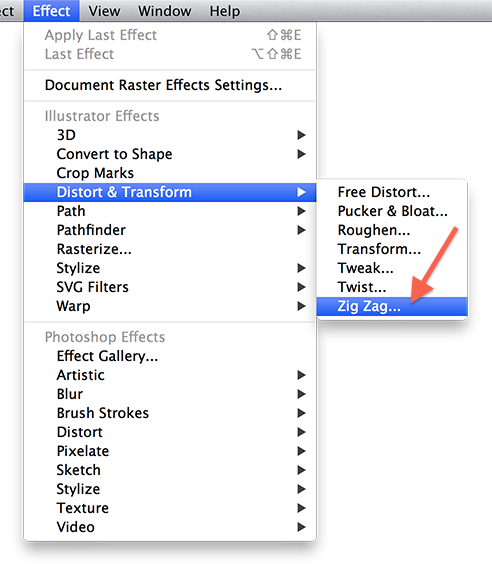 Create a new document there and use paste (CTRL/Command + V) to paste the drawing in Photoshop. It will ask what type of paste you want. If you expect scaling of this drawing: choose “Smart Object”.